What's up with Baguio City and the burning of Christmas trees? In January of this year, the giant Christmas tree installed at the center of the Rose Garden in Burnham Park was reduced to ashes in a suspected case of arson. Now, the Christmas tree art installation atop Session Road nearly had the same fate when it partially burned early morning on Monday (December 11). 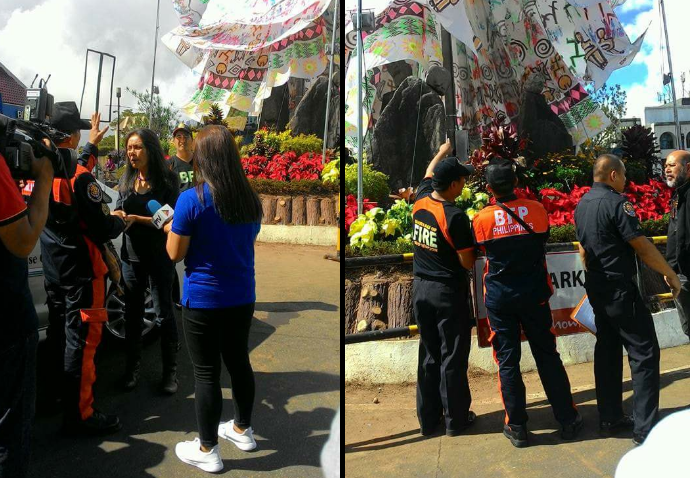 According to the Baguio City Police, the art installation on Upper Session Road was partially burned around dawn but the cause is yet to be established. Somebody (or some people) not happy with the design of the installation may have attempted to burn it down. If proven that this is the case, it would be tantamount to arson. But we can't discount the possibility that the case may be an accident. The installation has electrical wires and parts so there's always the chance that rogue electricity caused the blaze. The installation is the work of Maela Liwanag Jose, a Baguio-based artist. It received mixed feedback during its unveiling. But art is art. Just because you don't like the work doesn't mean you have the right to ruin it. You don't look at a painting and hammer it down to pieces if it doesn't adhere to your artistic tastes. On my part, Jose has my support. Truth be told, I'm among those who didn't really embrace the design of the installation. But I appreciate the fact that Jose took the risk of creating it. The work is unique. It's out of the box. And that's great. The best artists are those who create new ground instead of going with the flow. Fortunately, only two panels of the installation were burned. Restoration of the work will start soon with the assistance of City Hall.